London broil sliced on the bias. Photo by Deborah Kaplan. From the moment I met DH in high school geography class to present day, he has always played little practical jokes on me. 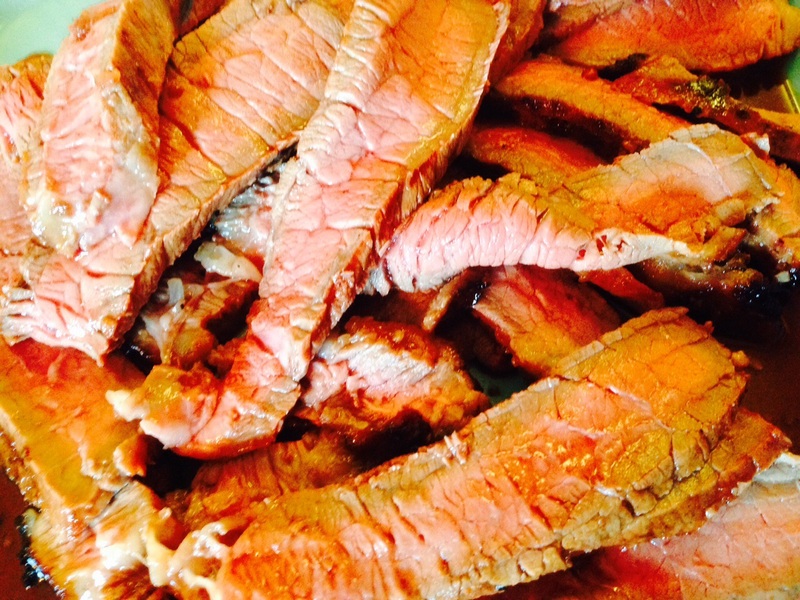 Keeping that thought in mind…Back in 1980, I marinated a 4 pound top of the round London broil in the refrigerator overnight. So the next night at 5 pm when I got home from work, I placed it on the broiling pan, discarded the marinade, and seasoned the meat with garlic. Turned the broiler on which unlike my broiler now was in a drawer underneath the oven. I then placed the broiling pan with the London broil on top into the drawer under the broiler. I then closed the drawer and set the timer for 6 minutes. DH came out of the shower and went in to the kitchen to get a drink. I went into the great room to set up our TV trays so we could watch the news while eating dinner. He came back in and sat down to look at the mail. The timer went off and I opened the drawer and the London broil was gone! I screamed at DH, “WHAT DID YOU DO WITH THE LONDON BROIL? ?” He said, he didn’t do anything with it. I yelled, “YOU DID TOO!! !” DH replied that honestly, he didn’t do anything with it. Of course I didn’t believe him at all. So he finally got up and came in the kitchen to look for it. First he looked in the oven, then the broiler, then like he thought I might be absentminded, he looked in the refrigerator. I told him that I had definitely put it in the broiler and now it was gone! So he took the drawer out completely. He then got a flash light and peered in. Only then did he see that the meat had slid back and fallen down the back, on bottom of the broiler. Apparently it was too thick. It went in fine, but when I opened the drawer, the London broil got caught on the top of the broiler. This caused it to be pushed off the broiling pan landing in the back. DH was able to fish it out. We ended up washing it and cutting off the part that was touching the bottom of the broiler. Back behind the drawer was disgusting! We don’t think it was ever cleaned since it was first installed in that apartment. By cutting off that part, it was just enough to fit in the broiler perfectly. It turned out great. This entry was posted in Food Thoughts and tagged Beef, london broil on November 29, 2014 by acadia2. 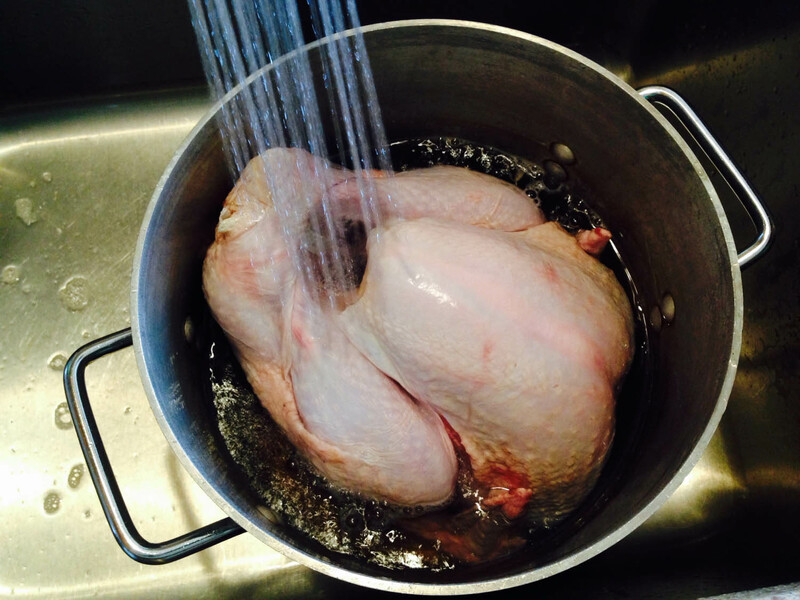 Defrosting turkey in the water method. In 35 years of marriage, I have roasted at least some of 35 turkeys and probably 100 whole chickens. So with that said, I have defrosted most of them in either of three ways. The first way, is to take the bird out of the freezer, and place it in the refrigerator so it can defrost totally which typically takes a couple to several days, depending on the size of the bird. The other way is to take it out of the freezer and place it in a tub of cold water, which helps to keep it cold yet defrosts it at the same time. The water is changed often. The third way is to do a combo of both methods. Most times, I do the combo method. This particular story is about defrosting a chicken. I took the chicken out of the freezer, filled up a large pot of water and placed it in it to defrost for the recommended time. Then, I took it out and placed it in the refrigerator as I planned to stuff and roast it for dinner the next day. The next day came, and I unwrapped the chicken. I looked at it with a perplexing look, as it was an odd shape, which I mentioned to DH. Then I went to retrieve the neck and giblets bag out of the breast cavity. The darn thing was still frozen! So I placed it back in the refrigerator and we went out for burgers. DH told me I planned it that way, so we could go out for dinner. Of course he was just teasing me, so the next day when it came time to prepare the chicken for the oven, I took it out again. And that chicken was still partially frozen! I could see and feel the giblets bag but couldn’t get it out. So, DH said to me, that I should let him try since his Dad had been a butcher originally, before going into poultry sales. DH couldn’t get it out either, so he went to the garage and got pliers and vice drips which he boiled to decontaminate them. Then I held the chicken and he pried it open and he was able to pull everything out. I changed my mind on stuffing it and decided to make a beer can chicken instead. Only then did I realize I had the chicken upside down the whole time. DH had pulled everything out through the neck hole. This story makes me laugh just writing about it. I’d like to say this happened when I was first married which would be a newlywed blunder, but no, it was a couple of years ago. I just do not know, what I was thinking? Happy Thanksgiving and I hope you all don’t have any kitchen antics! This entry was posted in Food Thoughts and tagged chicken, defrosting, Thanksgiving, Turkey on November 27, 2014 by acadia2. For most of our married life DH, our two daughters and I would alternate between DH’s Parents’ celebrations for Thanksgiving and mine. My FIL would create the menu and cook for the crowd of some 20-people. The whole bird on the carcass was never seen as he pre-carved it and placed it in chafing dishes or on platters. Everything was served family or buffet style, depending on how many people were there. The turkey was always very juicy which probably was due to his superior cooking ability and that it was a Kosher bird. I loved his stuffing recipe although I have only a vague memory now of how it tasted. As the years went by, DH’s sister took over the cooking of the feast. And when she owned a seafood restaurant in South Jersey, she would have the gathering there. She would not only cook a turkey or turducken, but other meats as well like venison, elk, ostrich, shellfish and various fish. She was always trying something new. Unless, you actually cook such a feast as this, the average person doesn’t realize all of the expense involved. I have heard of some people charging attendees so they aren’t footing the whole bill which can run in the hundreds of dollars. There are mixed feelings about it for sure. In our families typically everyone brings something, usually a dessert. My DD#1 always makes a delicious deep dish pumpkin pie and I bake bread. Since DH’s sister and her DH have moved out to Arizona full-time, we now have two Thanksgiving celebrations, our own and at my Parent’s house. Since 1979, every other year we would celebrate the holiday with my Parents, Sister and her family and our daughters. Thanksgiving at my Parent’s house was and is very traditional with the bird carved at the table by my Dad, served on good china with crystal goblets. The feast is always the same, and if they dare change anything, the family traditionalists will squawk NO! Then they will lament about it all year. So with that said, changes to the menu never occur. Their menu is always turkey, stuffing, candied sweet potatoes, mashed potatoes with giblet gravy, jellied cranberry sauce, either green bean casserole or broccoli drizzled with cheese sauce and cole-slaw. Pumpkin pie, chocolate cream pie, coconut custard pie or ice cream for dessert. I might also add that for the last 4 years we have celebrated Thanksgiving with them on Black Friday as my niece is a flag twirler at her high school in Central Jersey, and the school has a football game on Thanksgiving proper. As a result, DH, DD#1 and I often have our own Thanksgiving on Thanksgiving, and this year is no different. This entry was posted in Food Thoughts and tagged Family, stuffing, Thanksgiving, traditional, Turkey on November 24, 2014 by acadia2. On a popular food website during the last several years, I became involved in a forum where other home-cooks were interested in the flavors of the NA*ME (North African/Middle Eastern) region. In doing so, that is where I came in contact with concept of cooking with a Tangine. So when our daughters asked me for an idea to give me for my birthday, I suggested a Tangine. I was also picky, as I wanted one with a design rather than one that was a solid color. 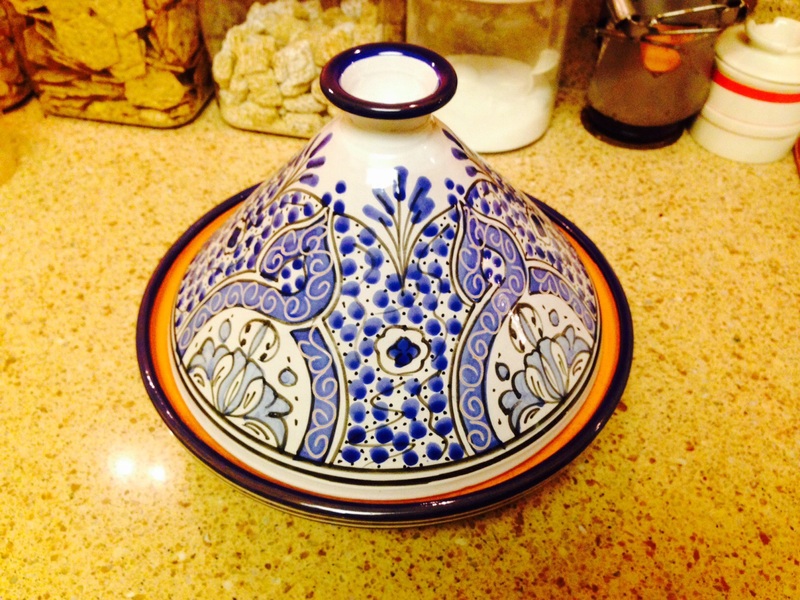 So back in February of this year, at my birthday, I received this beautiful Tangine cooking vessel. The only problem with it, is it came with no directions on how to use it. I searched the Internet and found that it is common place for Tangine vessels to be sold without any directions on how to use them. What I found was a big debate as to whether or not the top should have a vent hole or not. Mine has a vent hole and the ceramic interior also has a clear glaze. A lot don’t have the glaze and therefore need to be conditioned or cured before use. I thought I would be placing it in the oven, however I wound up using it on the stove top on a low flame. Some suggested using a diffuser: I did not, mainly because I didn’t have one. Then there was the time issue? I decided to jump in with both feet and I have to say the recipe I created came out delicious! DH and MIL also raved about it. I cooked three chicken thighs, which I browned first in a non-stick skillet. In my research, I did find out that the Tangine should never be used with high heat. After dinner, DH placed it in the dishwasher which I said no to, so he hand washed it. Since the dishwasher uses hot water plus a heating element, I didn’t want to risk causing the Tangine to crack. This entry was posted in Food Thoughts and tagged Birthday, chicken, stove-top, Tangine, Tangine-cooking on November 19, 2014 by acadia2. Raw lamb steaks perfect for grilling. Photo by Deborah Kaplan. Occasionally in the last couple of years, the local supermarket meat department had lamb steak as a cut, sold as lamb sirloin steak. The typical lamb cut that I have seen for sale on a regular basis has been either a shoulder-blade chop, lollipop rib rack, loin lamb chop or a partial leg roast. I figured out by the look of it that it was a cross-section of a leg of lamb. So, I went to our local butcher to buy a leg of lamb and had him slice it down into steaks at 1/2″ thick. The first ones I bought were amazing, tender and flavorful. The second group I bought was really tough as a hoe and I ended up using the all the steaks over a course of a couple of months in stews and soups. After that, I went back to the original source and saw that they had two legs of lamb roasts about 10 inches long in the case. Both roasts produced a combo of 10 steaks, plus 6 soup/stew bones and a quart sized resealable bag worth of stewing meat. Of course it came to $50.00 but lamb is not inexpensive and in the long run it was cheaper this way rather than buying just one lamb steak at a time. I prefer doing this as opposed to cooking the whole roast, as with just the two of us, we would be eating lamb everyday for a week. MIL as a rule won’t eat a slice of meat however she will use the stew bones to flavor her soups, plus she likes to eat the marrow. Well, now I have to go get the propane bottle filled so I won’t run out of gas in the middle of grilling these lovely steaks. 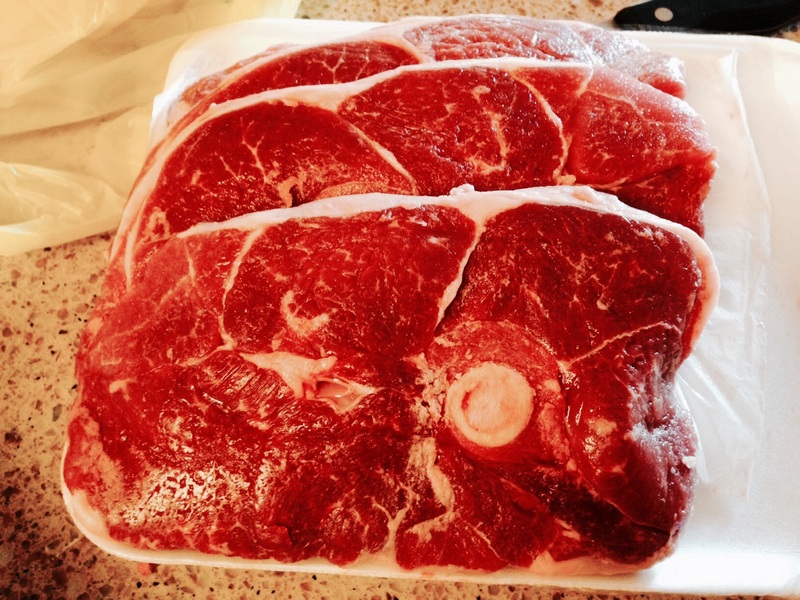 This entry was posted in Food Thoughts and tagged grilling, Lamb, lamb steaks on November 15, 2014 by acadia2. I bought the ingredients that I didn’t have on hand and the only miss step was that I purchased low sodium bacon. 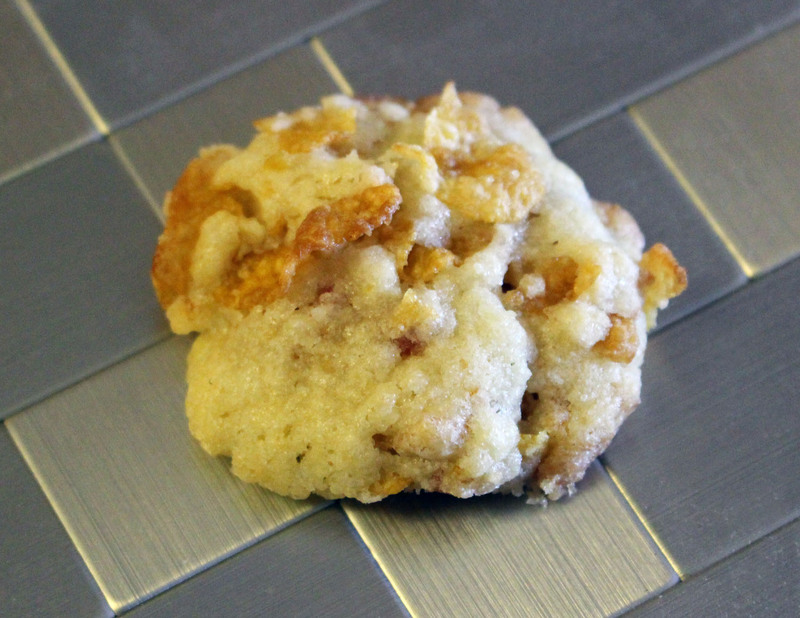 The cookie recipe produces a crunchy, soft, chewy treat. It reminds me of the cookie flavor I am looking for, however, I will have to make it again with regular bacon to be sure. My review which is attached to the recipe can be seen on the site should the link be followed: http://www.recipezazz.com/recipe/breakfast-cookies-with-bacon-15593 posted by Buzymomof3. This entry was posted in Food Thoughts and tagged Bacon, Breakfast, Breakfast Cookies, cookies on November 14, 2014 by acadia2. He Wants, He Wants, He Wants. DH is someone whom is very difficult to buy presents for. If he wants something, he generally will go out and buy it, even if it is the day before his birthday. Some times, it is exasperating, and I often have to rein him back, as I know someone in the family has bought him the very item that he wants to buy. Sometimes he outright tells me what he wants, so I can pass the ideas on to family members. Mostly, I tell them to just him get gift cards. About a month ago, he decided he wanted a toaster oven, but not any run of the mill toaster oven, but one that hangs under the cabinet. I had done an Online search and found that one company makes such an animal. The problem is finding it at a reasonable price. MIL said to me she wanted to give us one for the holidays coming up, and asked me to try to find this elusive toaster oven. After searching the Internet, we finally decided that we would just get a counter top variety regardless of what DH wants. So we devised a plan to clean off one of the counters to accommodate the new proposed toaster oven. The other option is to let him search for the exact oven he wants. After he purchases it then MIL would just give me the money toward paying for it. The Internet is perfect for me as I hate driving from store to store for comparison shopping. Not that I don’t like to get the best price, I just don’t like the means to the end. This entry was posted in Food Thoughts and tagged comparison, holiday, toaster-oven on November 13, 2014 by acadia2.